The IPR-10G-HDMI is a SMPTE ST 2110 to HDMI Mini-Converter suited for point-of-use applications including source monitoring and an HDMI feed to compatible devices. 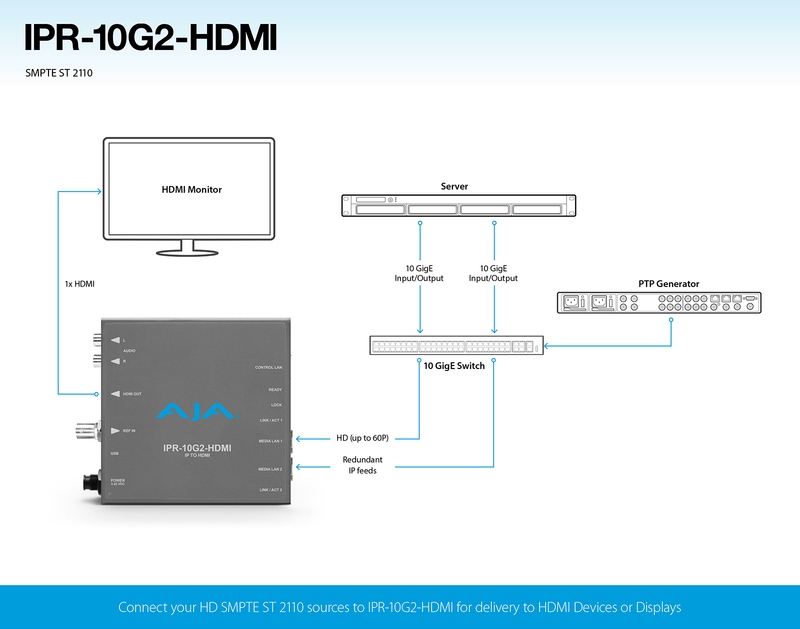 The AJA IPR-10G-HDMI receives SMPTE ST 2110 IP video and audio, then formats the data for output on a full size HDMI 1.4b interface. With 3G/1.5G-SDI routers often at capacity while facilities await their transition to IP, there is a huge benefit in being able to send video sources from a feed, camera, router or edit bay via IP and provide HDMI monitoring at the destination. The audio associated with the video stream is extracted, synchronized, and then embedded into the HDMI interface as well as output on an analog RCA interface. IPR-10G2-HDMI provides HDMI output from SMPTE ST 2110 video and audio over IP streams. Combine your IPR-10G2-HDMI units with AJA KONA IP for HD (I/O card for use in desktop workstations) or receive HD from servers and more to instantly create a real-world SMPTE ST 2110 workflow for video over IP production and monitoring. IPR-10G2-HDMI provides two key methods for control. The Control LAN Ethernet port enables control of the Mini-Converter from web browsers on any platform and REST clients. The mini-USB connector facilitates quick and simple initial network configuration, and firmware updates.